JW Lees was founded by a retired mill owner in 1828, an age in which working men would drink up to 12 pints a day. Five generations later, the 21st-century pub is a very different prospect, with changing demands and ever-increasing competition. The last 10 years have been tough for the pub industry. First the smoking ban, and then the recession; the industry has been hit hard. Those coming out the other side successfully have found themselves under other pressures: supermarkets continue to sell beer at discounted prices, young people are drinking less, coffee shops offer stiff competition for daytime trade and restaurant is as likely to be a competitor as the local boozer. It’s clear that what people demand of pubs has been changing, and still is changing. They are now places for women and men equally, as well as places for families. Clean toilets and nice soap matter. A dynamic service culture is vital. Great food is just as important as the great beer. They need to cater for people who want wifi as well as those who want to party on a Friday night. 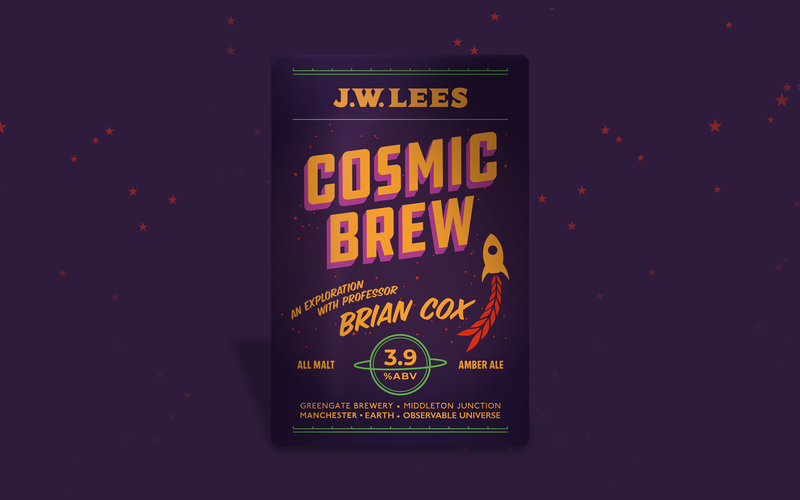 As one of Manchester’s traditional family brewers, JW Lees are often more careful with their heritage than the faceless pub corporations, but care must be taken to avoid being overly conservative in this rapidly changing world. JW Lees approached Squad to help them answer a critical question: what is our role in the world? Squad interviewed management, held workshops and participated in company-run ones. We visited pubs right across the managed and tenanted estates, we talked with managers and visited competitors. Industry experts provided us with unbiased opinions and we began to piece together a rich picture of the opportunities and issues facing JW Lees. It became clear that people love working for JW Lees, and that there is an incredible loyalty to the business and the family. But despite people’s passion, they were frustrated with not understanding the company’s vision. They were clearly aware of its vision and value statements, but something wasn’t working. It became clear through our investigations that there had been too many statements pertaining to the vision and values. And that they’d changed too frequently, often before being properly implemented. Most obviously, their latest iteration, ‘Be yourself’, was receiving mixed reviews, and was open to misinterpretation. However, its biggest problem was that it didn’t paint a picture. • Get agreement amongst the board members on what success looks like. • Create a single compelling vision that will replace all existing ones, and will be stuck to for years. • Bring the vision to life in a way that lights a fire in people’s bellies. • Align the business behind the vision. We knew the right vision would be critical for energising the business, particularly for those outside the family. Our challenge was to ensure that not only was it motivating, but that it worked across the three core areas of the business: managed houses, tenancies and free-trade accounts. For a business like JW Lees that’s been around for nearly 200 years, revolutionary change is not something it’s necessarily used to. But the world is changing, and change provides JW Lees with fantastic opportunities: wouldn’t it be wonderful if future generations of the family looked back proudly at what this generation had achieved? It was clear to us that a more innovative culture was required in order to avoid letting others steal the show. But it needed to be done in a way that was befitting for a 190-year-old company. We knew it would be important to be proud of where you come from, but not to let it define you. While there are still many challenges facing a 21st-century pub company, at the same time, it is also an increasingly exciting time in the industry. As one interviewee told us: "never in my lifetime has there been such an interest in beer." However, we’d found that many of JW Lees’ competitors were losing sight of the brewing, and were splitting breweries and pubs into different businesses, but JW Lees were resolutely committed to brewing beers. At the other end of the scale, the hipster beer brands, while incredibly exciting, could only dream of the rich heritage that JW Lees has in barrel loads. Our idea was to put the brewery back at the heart of the JW Lees business, and use it as our magnetic north. Through the statement ‘the modern traditional brewer’, we encapsulated the notion of being true to those who came before you, but living for those yet to come. To keep alive two centuries of heritage and tradition, while striding forward into the future. 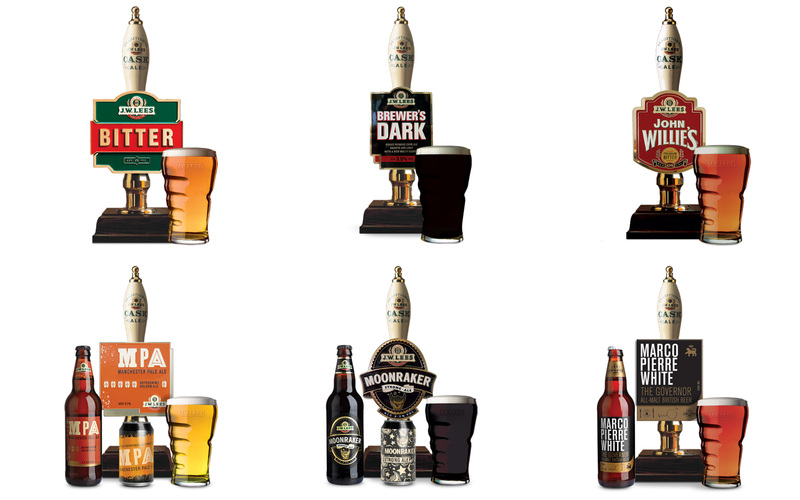 We put brewing firmly at the heart of our family business and create best-in-class pubs in which to enjoy our beers. Places full of atmosphere that celebrate the timeless union of the best pint, with the best hospitality, and the best food. We created a rough-cut film to get agreement among the board members. The galvanising effect was so powerful that we quickly started work on a brand film that could be used both internally (for staff) and externally (for customers). We worked closely with the Director of People to integrate the positioning and the refined values into the business. Before the launch of the new mission, we directed a cleansing of the business – removing any old statements pertaining to the old missions and vision statements – leaving room to seed the new one. The JW Lees Annual Conference was the ideal platform to launch the new positioning. Having themed and dressed the room, we set about delivering the first public airing of our film, which was unanimously well-received by staff and delegates. 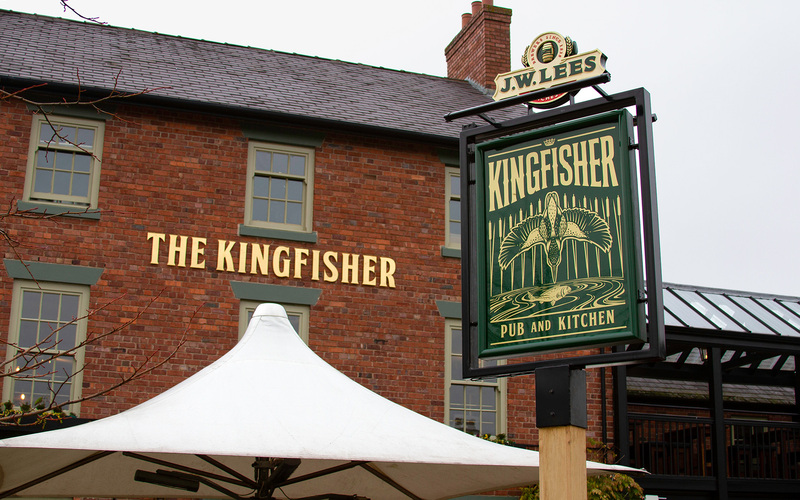 Beyond the conference, we recommended that their mission was best actioned by putting the brewery at the heart of their pub design, food offer and staff training. 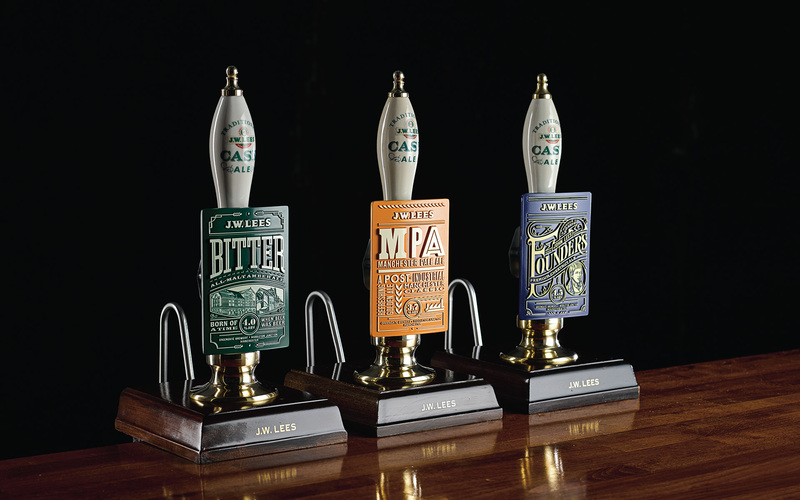 JW Lees jumped upon this, launching initiatives such as their Ale Academy and taking a fresh look at their food offer. 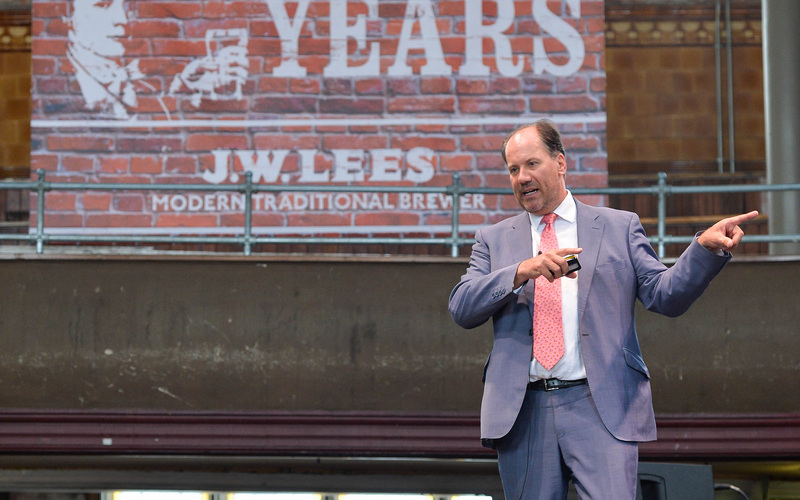 Squad and JW Lees agreed that investment must be made into the company’s reputation as a beer brand. 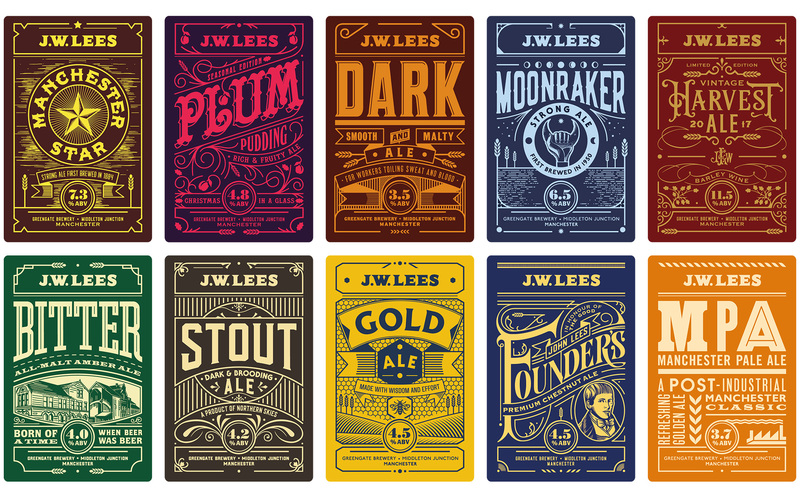 We wanted the JW Lees name to become a brand that people recognise and seek out for a great pint. The beer range had been developed over time and had taken on the appearance of a series of guest beers, rather than being a proud family of great beers. We identified the importance of creating a family of beers in order to improve the branding in pubs, but we also needed hero beers that could stand alone. Our competitor reviews highlighted that many had a strong family look but weak hero brands, or strong hero brands but a weak family look. Doing both was clearly difficult and few succeeded in achieving both, so we made this our goal. We felt it was important for our beer identity to reflect the ‘modern traditional brewer’ positioning. Our solution was a bold typographic identity that eschewed the restricted family of fonts usually associated with an identity system, in favour of a graphic approach that achieved consistency through deliberate diversity. Our font choices were wide and varied, many born of the Victorian era, but their composition flexed to suit the beer, a moment in time, or a story. By doing this we avoided the fonts being associated with just the 1800s, or the middle-of-the-road approach of everything looking contemporary/traditional. Traditional beer names were retained and the JW Lees name was proudly situated at the top of each pump clip. Living up to the promise of the new vision meant not just rebadging beers, but creating innovative new products as well. 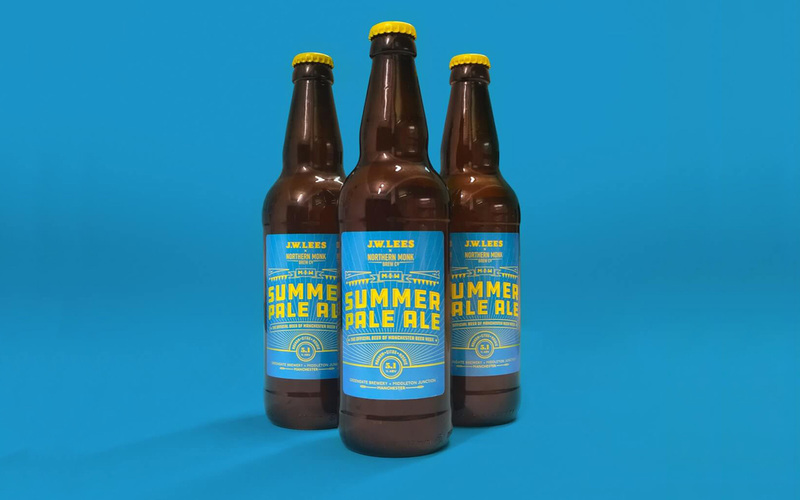 We worked with JW Lees to create Stout and Gold in the ale category, while Manchester Craft Lager saw them significantly up the ante in the lager market. This process has continued as we’ve worked together on seasonal ranges, collaboration brews with Professor Brian Cox and Northern Monk, and an experimental micro-brewery range called The Boilerhouse. In the words of our poem, JW Lees exist to celebrate the timeless union of pint and pub. Having revitalised the beer range, the next phase became the pubs. Our approach was to ‘put the brewery at the heart of the pub’. The bar would become an alter to the new range. The beers and brewing would be showcased throughout the interiors. Individuality is important to a JW Lees pubs. They avoid the identical, corporate approach in favour of character and personality. When it came to branding the pubs, the approach needed to reflect this. 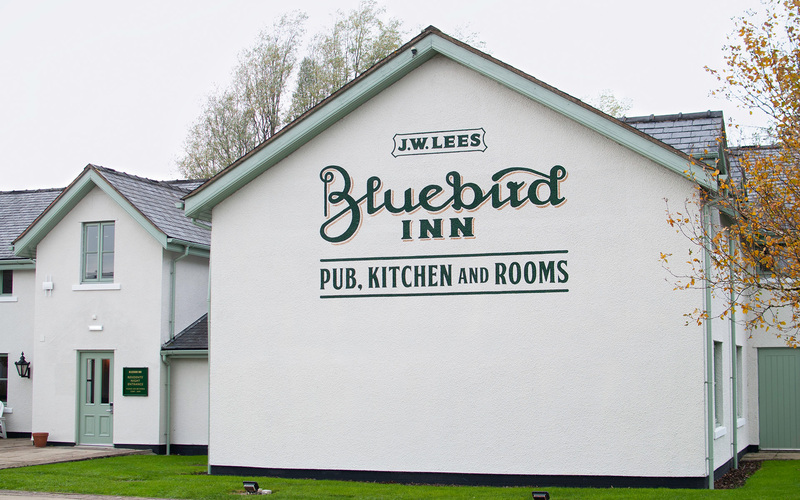 It needed to connect the pubs as a family, making them feel uniquely JW Lees, while letting the individuality of each shine through. Our solution mirrored the approach of the beers - a bold, graphic approach that achieved consistency through deliberate diversity.